An international trade fair for construction equipment and mining machinery, bauma takes place every three years in Munich. This year the event will be held April 15-21, 2013. What sets this exposition apart from others is its sheer size, 3,256 exhibitors occupied 555,000 m2 of space in 2010. To put that into perspective, MINExpo 2012 was less than 80,000 m2 and CONEXPO 2011 was less than 220,000 m2. Attendance for bauma 2013 is expected to easily eclipse 500,000 people. Tunneling has always been an important aspect of bauma, but tunneling and mining are two different disciplines. Over time, the mining portion of the exposition has grown steadily from a bolt-on segment to a prominent position. In 2007, the mining sector was given its own hall (C2). Today, the mining sector is the one of only a few areas showing growth because of the downturn in construction markets in Europe. Exporting equipment to emerging markets, in both construction or mining, has become a central focus for many equipment suppliers and service providers. 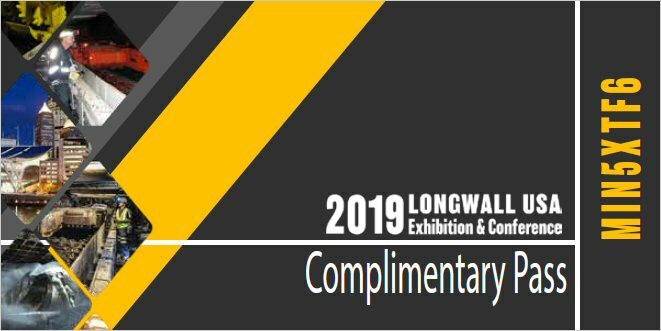 While the Mining Hall will be an important meeting place for many, several vendors are so large that their exhibits simply include mining as one vertical market among the many they serve. And, just as one large equipment supplier dominates the American expositions, Liebherr has been and will continue to be the central focus for bauma. Not wanting to give away the big surprise, Liebherr does plan to have one large mining truck and one mining-class hydraulic excavator on hand. For many, that will serve as the landmark for the outdoor portion of the event. In late January, Messe Munchen invited journalists from the leading trade publications to Munich to meet with key exhibitors to learn what was in store for this bauma. 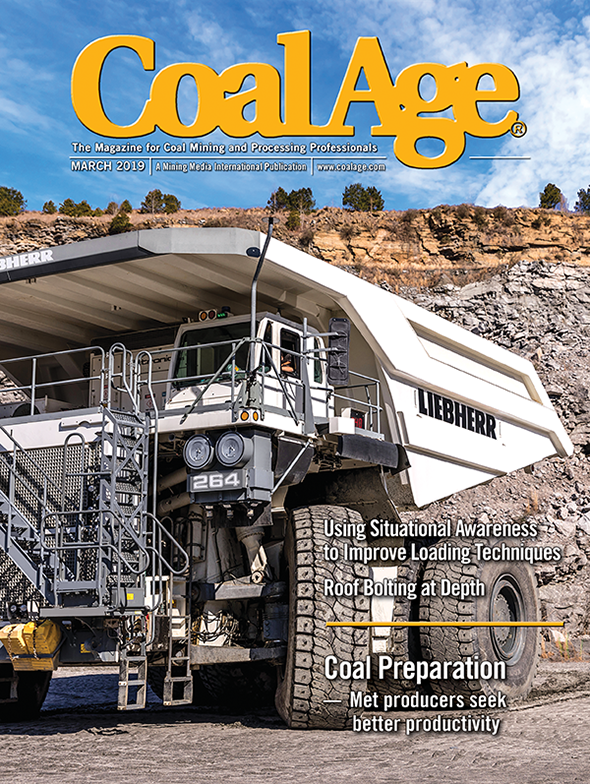 Coal Age and Engineering & Mining Journal were on hand representing the mining business worldwide. What follows is a snapshot of some of what delegates can expect to see this spring in Munich. The Liebherr Group is the largest bauma exhibitor (14,000 m2) and the company will showcase many new pieces of equipment and existing equipment, which has been further developed. Construction on Liebherr’s open-air stand began during November 2012 and during late January it was starting to take shape. The open-air site includes eight tower cranes, two mobile construction cranes, 10 mobile cranes, four crawler cranes, three duty-cycle crawler cranes, a large rotary drilling rig, three wheeled excavators, seven crawler excavators, eight wheel loaders, three crawler tractors and loaders, a pipelayer and a telescopic handler, six exhibits from the concrete technology program, two material handlers as well as an articulated truck, a mining-class haul truck and a mining-class excavator. To demonstrate its pass matching capabilities with haul trucks, Liebherr will present the face shovel version of its 350-ton R 9400 mining excavator. With a 22-m³ bucket as standard equipment, Liebherr believes it is the ideal machine for loading a mining truck in the 136 metric ton (mt) class. The kinematics of the production-tailored attachment combined with a mining-optimized bucket shape ensure the highest crowd and breakout forces. Even under tough conditions, Liebherr believes the R 9400’s high digging force will improve bucket penetration and offer high bucket fill factors. The R 9400 follows the Liebherr design philosophy of maximizing the machines performance by improving the efficiency of all individual subsystems. Engineered for optimum serviceability the machine is designed to ensure maximum uptime. Designed for hard-digging applications, the R 9400’s heavy duty 3-piece fatigue-resistant undercarriage provides efficient superstructure weight distribution and reduces ground bearing pressure enabling the necessary stability and reliability. Optimizing electrical, mechanical and hydraulic power distribution, the Litronic Plus System allows for easy control even when simultaneous movements are required. Every attachment cylinder is fitted with the patented Liebherr Electronic Damping System that provides controlled end-cushioning for fast and smooth machine’s motions. Intelligent and power-oriented energy management diverts the pump flow during boom lowering, allowing other cylinder motions to operate unimpeded. The R 9400 is powered by a Cummins QSK50 diesel engine that complies with USA/EPA Tier 2 exhaust emission limits and has a rated output of 1,250 kW (1,675 hp). The electric-motor drive also available is an economically viable alternative in a number of application areas, for instance machines intended for work in arctic regions. The R 9400 has a wide, spacious cab that provides the operator with the comfortable working conditions needed for maximum productivity. Mounted on vibration dampers, it also reduces the noise level and creates a quiet environment that promotes the excavator operator’s own performance. In addition to its excellent ergonomic design, the cab provides maximum protection for the operator. The robust steelwork of low-stress design and the safety-glass windows comply with the FOPS standard and protect the operator against falling material. For maximum safety there are several easily reached emergency stop buttons at ground level, in the cab and in the pump and engine compartments. All machine accesses have been optimized. The R 9400’s upperstructure is accessible via a powered 45° stairway fitted with handrails and the service drop down flap provides easy access to the main servicing features. Fuel, engine and hydraulic oil, grease, windshield wash water can be refilled and drained from ground level. There are currently more than 30 R 9400 hydraulic mining excavators operating in four countries. The latest R 9400 commissioned in a gold mine in Ghana is the first model in face shovel configuration. With nine Tier 2 engines and nine Tier 4i engines, Volvo Penta can now offer the mining industry a complete range of engines approved for underground mining applications. These new engines are not only compliant, they also lessen the demand on mine ventilation systems. In 2011, Volvo was one of the first diesel engine manufacturers to receive stage 3B and Tier 4i certificates for its entire engine line-up. Later, the Volvo Penta 13L Tier 4i diesel engines were the first engines to be certified by the U.S. Mine Safety and Health Administration (MSHA) and the Canada Centre for Mineral and Energy Technology—Mining and Mineral Sciences Laboratories (CANMET-MMSL). With its new extended range of engines for mining applications Volvo Penta has made it easier for manufacturers to provide compliant mining machines and vehicles. The new engine line-up consists of 18 engine variants, nine certified for Tier 2 and nine certified for Tier 4i. The Tier 2 engines are the TAD 941/1340/ 1341/1342/1343/1344VE-series ranging from 300 to 479 hp and the TAD1640/1641/1642VE-B-series which ranges between 551 and 700 hp. 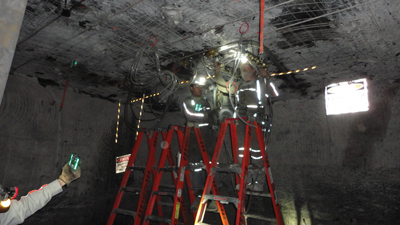 Ventilation represents a huge cost for underground mines. With a ventilation rate of around 30 cfm/hp, the Tier 4i engines deliver the maximum ventilation rate available for a conventional diesel engine. The Tier 4i engines in the new range are the TAD1360/ 1361/1362/1363/1364/1365VE-series going from 348 to 551 hp and the TAD1660/1661/1662VE-series between 551 and 700 hp. All of these Volvo Penta Tier 4i engines are equipped with a selective catalytic reduction (SCR) units. The SCR technology is the choice Volvo Penta has made to comply with current and future emission legislation. Since Volvo Penta introduced its first SCR engines in 2006, the benefits for the users have been increased power and lower fuel consumption—by 5% -10% compared with corresponding engines. And since the catalytic converter was designed to last the life of the engine, the Volvo Penta SCR systems haven’t demand any increase in service intervals, or caused any additional downtime. The SCR system is based on high-efficiency combustion which reduces the fuel consumption and results in extremely low levels of particulate matter (PM), but also in high levels of nitrogen oxides (NOx). The exhaust NOx is converted into harmless nitrogen gas and water vapor. This is made possible thanks to the SCR system which automatically injects up to 5% AdBlue, a diesel exhaust fluid, to the exhaust gases. The gases are then passed through a catalytic converter before they are emitted to the environment. The extremely low levels of particulate matter in the emissions also make exhaust gas filtration (DPF) unnecessary. Throughout the world, eXtra Abrasion Resistant (XAR) special structural steels from ThyssenKrupp Steel Europe make the mining, transportation and processing of raw materials easier. Hard rock, fluctuating climatic conditions and extreme loads are no problem for the robust XAR steels. They were developed especially for applications requiring maximum wear resistance. With 30- to 100-mm plate thicknesses, XAR steels offer optimum solutions for all areas of mining equipment. Alloyed with chromium and niobium, they display hardnesses of up to 600 Brinell, guaranteeing optimum wear resistance. Components made from XAR steels last five times longer than conventional structural steel components. XAR steels also meet the highest requirements in terms of quality and processing properties. They are ideal for press braking, bending, welding and cutting. In addition, with thickness tolerances as low as ±0.2 mm, XAR heavy plate can help reduce weight. With the spectrum of grades ranging from XAR 300 to XAR 600, steel solutions can be tailored to requirements: XAR 400 is the most commonly used variant. It is suitable for example for screening and crushing machinery. For components subject to less extreme loads, transfers and chute work, XAR 300 is recommended. This steel combines optimum surface quality with outstanding cost-effectiveness. XA 600 offers the highest wear resistance—for use in haul trucks. For applications in excavating and earth-moving machinery where the going is particularly tough, XAR HT (High Toughness) is the material of choice. The Spanish ground-engaging tool manufacturer MTG recently built a new plant located in Monzon. “What makes this factory so special, besides being equipped with the most innovative technology in melting manufacturing, is the special equipment that allows us to control the steel alloys to an optimum and makes it possible to produce bigger wear parts for mining and heavy construction without the risk of breakage or damage,” said Raul Rico, industrial operations vice president, MTG. The plant has been specifically oriented to expand the company’s available product range toward larger mining and heavy construction wear parts. MTG will continue to operate its existing plant in Barcelona. During bauma, the company will display its new MTG ProMet II, which has one single upper base instead of two, allocating more wear material in the front part of the shroud and increasing its wear life, improving penetration, and extending the bucket life. Each new ProMet II size is available in three formats for the bucket lip: central, left and right, with specific angles designed to cover the needs of the main markets. However, new designs and references might be developed in the future to cover other markets’ specific needs. The company has also developed an iPad app for selecting wear parts. In 2012, MTG successfully published and tested a trial version (1.0) of the app, which has since reached more than 150 app downloads from 32 countries, and more than 8,000 file downloads. MTG will launch the new version (2.0) at bauma, which the company claims will be more interactive and better organized with a wizard tool to help users configure their buckets with MTG’s teeth and adapters. Working with Rio Tinto, Aker Wirth has developed a new, innovative tunnel boring system for underground tunneling and mining—the Mobile Tunnel Miner 6 (MTM 6). The machine concept combines the flexibility of a roadheader with the robustness of a tunnel boring machine. The knowledge gained from a previous version developed by Aker Wirth and tested by Chilean copper miner Codelco was used to make further improvements to the system. The self-propelled machine moves on a crawler and a walking mechanism and excavates rock with six powerful hydraulically actuated arms fitted with disc cutters. The muck is conveyed to the rear of the machine by a loading apron with loading disks and via a chain conveyor where it is loaded. This new tunneling system is part of Rio Tinto’s Mine of the Future program and will be tested this year in a full-scale trial at the Rio Tinto Northparkes copper mine in Australia. The machine should set new standards for mine development. When compared with conventional drill and blast operations, the MTM 6 is designed to more than double current performance with a potential advance rate of 10 m/d. With undercutting technology, the MTM 6 is especially efficient with tunneling in hard rock (up to max. 300 MPa). The considerably lower tensile strength of the rock when compared to compressive strength is exploited in this respect. The roller cutters are positioned at a slight angle to the cutter arms, thus undercutting the rock and removing pieces about the size of the palm of a hand. The energy required for undercutting is about half that used for conventional disc cutters on traditional tunnel boring machines. The MTM 6 is able to cut rectangular or horseshoe-shaped cross-sections in addition to circular tunnels with a bore diameter of up to 6 m. This permits the direct boring of the desired tunnel shape, whereas the lower part of a round cross section usually needs to be backfilled where a conventional tunnel boring machine is used. With a flexible bore diameter of up to 6 m, the self-propelled Mobile Tunnel Miner can be used for a variety of applications. The machine is also an innovation in terms of its mobility: it can move flexibly forward using a walking mechanism and backward with a crawler. Thanks to several swivel joints, the turning radius of the 75 m long machine is only 30 m. This means it can master considerably tighter curves than a classic tunnel boring machine that has a turning radius of approximately 500 m under comparable conditions of use. In contrast to drill and blast, which up until now has been the usual method employed in rock of this strength, tunneling with the MTM requires considerably less work from personnel at the tunnel face. The machine is operated from a central control cabin located on the machine itself. The high degree of automation minimizes contact between personnel and both moving components and rock. Thanks to its flexibility, the MTM can be easily driven away from the tunnel face for maintenance purposes, which also contributes to the safety of operating personnel. The Beumer Group, a leader in material handling and conveying, will deliver 16 belt conveyors to Vale for its iron ore transloading facility in the Andaman Sea. The order, which is valued at more than $100 million, was placed for Vale Malaysia Minerals, which is constructing an iron ore distribution center in Teluk Rubiah. At the facility, iron ore will arrive from Brazil and then be blended and shipped to customers throughout the Asia-pacific region. The Beumer troughed belt conveyors off the Malaysian coast, in the Strait of Malacca, will transport iron ore from very large ore carriers to smaller vessels in a specially designed port and storage facility. Construction work is already in full swing. The loading terminals are expected to go into operation in 2014. A second expansion phase will run until 2019. The Wirtgen Group’s Mineral Technologies division will display a well-matched range of products for mining and mineral processing: Wirtgen surface miners and Kleemann crushing and screening machines. Some shallow, soft relatively deposits can be mined effectively without conventional drilling, blasting and pre-crushing. One popular mining method for lignite and iron ore uses the Wirtgen surface miners. These units function much like cold milling machines, cutting and crushing the coal (or rock) with a special cutting roller. Conveyor systems load the material onto haul trucks or place it in windrows alongside the surface miner. Wirtgen offers three classes, the 2200 SM, 2500 SM and 4200 SM, which have cutting widths of 2.20 m to 4.20 m and cutting depths of 20 cm to 83 cm up to a uniaxial compressive strength of 120 MPa. Special machines can even cut hard granite up to 260 MPa. Moreover, Wirtgen is the only manufacturer that covers a performance spectrum from 100 metric tons per hour (mt/h) to 3,000 mt/h. Kleemann’s products are designed to handle the hardest minerals and materials in the mining industry. The company offers single machines or interlinked combinations. Jaw crushers serve as classic primary crushers. The mobile machines’ performance spectrum ranges from 100 to 1,500 mt/h. Robust, high-performance machines with feed capacities from 450 mt/h to up to 1,000 mt/h are used for traditional quarry applications. Secondary crusher units such as track-driven impact and cone crushers are electrically interlocked to work in tandem with primary crushers and screens. The screen area of the chain-driven screening machines ranges from 7 to 18.4 m². Their performance spectrum runs all the way up to 1,000 mt/h, making them well-suited for demanding tasks and material that is difficult to screen. Rema Tip Top will display its line of products and services that improve conveyor op-erations. The company’s Remaslide LF, a low-friction, slider bed bar, supports conveyor belts at transfer points. The polyethylene coating has been improved not only to reduce friction, bt also to resist wear. The company will also display its Remagrip CK-X pulley lagging. Both the 20-mm CK-X HD and the 25-mm CK-X HDX will be on display at the Rema stand. Erlau will be celebrating its 70th anniversary as a tire protection specialist at bauma. Capturing 75% of the market for the big tire chains, it knows a thing or two about tire protection. On the stand at bauma, it will have share two new ideas: the Easylock hasp for installing and removing tire chains and the Sideflex, which protects the tire’s sidewall from cuts. The Easylock is a true innovation that overcomes several problems common to the installation a removal of tire protection chains (TPC). It is a connecting ring that can be fitted and removed, without hammers or cutting torches. The device consists of two components, an omega ring and a locking hasp. The ring is passed through two adjacent links and the hasp pushed over the prongs of the open ring. The hasp incorporates a locking device that is secured with a 90° turn, in either direction of a simple Hex key. Once locked, Easylock remains securely in place until it is removed in the same simple 90° procedure. Due to long distances, weight considerations and increased fuel costs, the TPCs are not an economical option for haul trucks. To overcome the problem, Erlau invented Sideflex—the first cost-effective sidewall protection for haul truck tires. The device consists of a sturdy set of replacement wheel nuts and extensions supporting a flat ring to which is attached a fanned array of over-lapping platelets. In action, the platelets shield the entire sidewall and deflect any aggressive rock debris that might otherwise pierce the. While the mounting components are made of steel, the Sideflex shield is manufactured from an engineered polymer. This robust material has a unique memory capability that enables the platelets to flex and deform upon impact and then return to their original shape, time after time, without any loss of integrity. The entire Sideflex assembly is so lightweight and low-profile that, for the first time, owners of dump trucks, both large and small, have a cost-effective means of protecting their assets. For years, McLanahan Corp. has been a well-known and respected name in North America’s mineral processing industries. In 2012, it opened its first office in Europe where it has continued to grow and expand its operation there. The company will be exhibiting for the first time at bauma 2013. Visitors will see McLanahan’s full line of crushing, washing, classifying, dewatering, feeding, screening and scrubbing products represented with 3-D models. Additionally, sales and engineering staffs from both the European and North American offices will be on hand to answer questions about how McLanahan can provide a custom engineered solution for your application. Orlaco will present the many safety options it provides for mining and construction vehicles, cranes and forklifts. In mining, where continuous vibrations and temperature fluctuations are common, the requirements for systems used in these conditions are high. Orlaco’s visibility solutions meet all high quality requirements. Products and processes are certified according to international standards. The company’s radar system, RadarEye, gives the driver an active warning. It sounds an audible alarm, automatically activates the monitor, and selects the correct camera. The radar is integrated in the visibility solution, which means the settings for the radar unit(s) and camera(s) can be controlled from the monitor. The ALLU Screener Crusher is a versatile accessory for any wheel loader or hydraulic excavator. It can screen, crush, pulverize, aerate, blend, mix, separate, carry, feed and load all in a one-step operation. These devices have been working successfully around the world in many different applications. The latest successful application has been found in the power industry where ALLU is crushing coal. The design of the crushing drums allows all of them to crush coal efficiently. Even the biggest lumps can be crushed into fine homogeneous fragment size. The new Bell B30E will take center stage for Bell Equipment at bauma 2013. Following the modular performance class concept, Bell launched its new 30-tonner together with the smaller Bell B25E, both incorporating latest developments in 6×6-technology. While continuing to provide class leading power and weight-ratios, advanced engine and drivetrain characteristics, both models set new standards in safety, driver comfort and truck management. The Bell B30E showcases the improvements Bell Equipment’s design engineers have made in the key areas of performance and fuel efficiency. They have also taken ADT functionality to new levels with customer-focused advancements and the highest level of automated machine protection. The all-new truck platform has been specifically engineered to handle future emissions requirements and take ADT innovation into the next era. Fuel burn can contribute more than 40% of the operating cost on a site and has always been a major focus area for Bell Equipment, especially in reacting to international emissions restrictions schemes. The latest generations of Bell D-series trucks introduced the “[email protected]” SCR-technology as an industry leading standard in fuel-efficient emissions control, compliant to Tier4i and EU-IIIB. While the E-series platform has been designed for upcoming legal requirements, first generations of the new B25E (210 kW/1 120 Nm) and B30E (240 kW/1 300 Nm) continue to use the proven [email protected] engine configurations of their predecessors, but engine power and fuel consumption have been additionally optimized through event dependant software that controls retardation, cooling and charging of accumulators. Bell Equipment’s D-series platform, particularly for its larger ADTs, has continuously emerged as the best in class during its long lifetime due largely to the company’s evolutionary approach to design. It should come as no surprise that Bell Equipment engineers have opted to carry this platform through to the smaller trucks in the new E-series range by changing the front suspension on the smaller E-series trucks to an A-frame layout. “We’ve increased the suspension travel and the A-frame gives a more independent ride. In ride quality evaluations numerous operators have been unanimous in their approval and appreciation of the improvements achieved on the E-series,” said Tristan du Pisanie, Bell Equipment’s B30E project manager. Additionally, wider tires are offered as an option on the B30E, while still keeping the machine width below 3 m to allow for easy on-road transportation of the truck to job sites in Europe. Bell Equipment’s satellite fleet monitoring system, [email protected] is also undergoing a major facelift with a new web application focusing on mapping utility so that [email protected] is available on all multi-media including tablets, smartphones and PCs. The geofencing feature is to be reconfigured to increase vehicle safety by facilitating geofencing in multiple zones based on speed limitations related to load, inclination and site conditions. Bell Equipment’s other innovations such as keyless ignition, HillAssist, Bin Tip Prevention, Auto Park Application (APA), standard Turbo Spin Protection and On-Board Weighing (OBW) are still standard on the E-series. OBW-Accuracy has been improved through the addition of an additional load cell to compensate for different loading styles.